You know that corporate sales guy that’s been out getting those web and print design orders that land on your desk everyday? He’s not coming with you on your freelance excursion down the yellow brick road. From now on, you’ll be doing his job too. So you may have become the most talented graphic/web designer in your immediate circle of friends, but unless you can effectively sell those skills to that new business owner, your trip down freelance lane will be short lived. You have to know without fail, what you are going to do to generate new clients once you are out on your own. The big design firms can afford to have full time marketing people out on the street, so you will have to find a way to compete for those business dollars if you are even going to have a chance to make it. There is no such thing as “winging it” in today’s business climate. You need to have a plan and learning how to bring on new clients is a mandatory requirement in your new endeavor. Most graphic artists and web designers would rather rip their toenails out than do what I do-sell. They conjure up images of being the next Billy Mays style pitchman hawking Ginsu knives at some county fair, when in truth, business to business selling is nothing like that. So let’s look at some ways to prepare to be out on your own without ending up in a bread line. Any sales professional lives by this credo. You don’t engage in activities that are not related to making sales and bringing on new clients. As a freelance designer you will need to have some simple skill sets related to preparation and presentation that shouldn’t be that painful. The first thing you will to do is know your market. You can invest a small amount of time each day into developing prospects that you will contact. If you are driving by that same jewelry store every day, then go on the web and look for their website. If they don’t have site, then they have now become a prospect for your services. Casual contacts are another effective way of offering your services. I have a higher ratio of closing sales through informal contacts than I have through cold calling. If you’re eating at the local Italian Restaurant, casually ask the waiter, who just might be the owner, who produces their menus. Simple question, non invasive and I don’t know anyone who has ever been killed for asking it. You might just get, “Why, do you design menus?” as a response. I have seen many simple conversations like this turn into sales or appointments. But what about the cold call? Let’s dissect that fear inducing sales call and learn how you can take the pressure off of you and stack the deck on your side through a few simple steps. You’re a designer right? Then as part of your preparation you need to have an informative brochure or sell sheet when you are going to approach a new business prospect. Some sales people refer to this as a “leave behind”, but I’d prefer to think of it as your presentation. It doesn’t have to be fancy and printed on the nicest gold-gilded paper, but it does have to tell your story. If you’re great at page layout, but not so great at writing copy, maybe you have a connection or two that can assist you in this area. I’m a big fan of bartering among contemporaries, so maybe you can offer your skills to someone on a future project if they’ll help you write some copy for your sell sheet. On your sell sheet you need to have some samples of some websites and any other kind of advertising you’ve created. It needs to be neat and professional because it is going to be the best representation of what you are offering. In this “get to the point” society we live in, I recommend letting the pictures tell the story and limit the amount of text. You can actually produce this quite inexpensively and print it on a color printer or save the file on a flash drive and take it down to the local copy center and have a few color copies printed out. When you are starting out on your own, watching expenses should be a top priority as you look for ways to market yourself without spending boatloads of cash. So now you’ve got your four-color sell sheet in your hand along with your brand new freelance business cards and you are now going to call on that jewelry store owner. I would like to suggest that you go in first thing in the morning. If they open at 9:00 you should try to go in around 9:15 or 9:30. You are much more likely to catch the owner first thing in the morning than you are if you went in at say, 2:00 in the afternoon, when the owner may be in the back making a repair or assisting a customer who deserves the owner’s full attention. So you walk in to the store and you notice the owner laying out the jewelry displays in the cases like he or she does every morning. The owner looks up and says, “Can I help you?”. You need to smile at this point and then walk over and introduce yourself. “Hello my name is John Johnson and I own Web and Print Design on a Budget” and you hand the owner your sell sheet. Miraculously, two things will now happen. The first thing is the owner will take your sell sheet from you because that’s what people do when you hand them something and the second thing is they will look at what you just gave them. Simple right? I never said this was rocket science. Then you will want to point to a few highlights on the sell sheet they are looking at while telling them that you wanted to offer your services should they have a desire to have a presence on the web. “Offering your services” is a very friendly, non threatening, non sales type of language to use in this type of situation. I would also recommend having packages with pricing right on the sell sheet. This way the prospect can choose between a simple four page website that costs X, versus the deluxe web package that includes up to six pages with forty optimized photographs (or whatever) that costs Y. This is called an “alternate close” as it gives the prospects more than one option to say yes. You have to be aware of how the business owner is responding to your presentation. If they smile at you after you hand them your sell sheet and say,”Thanks, I have a hundred of these from other freelancers”, then you may want to think about moving on, but if they start asking questions, you may just have a new client. Questions that begin with “How much would it cost if I…” show that the owner is now involving themselves in your product. They are thinking about what life would be like with a new website. Why else would they inquire about the costs associated with adding a “weekly specials” page on top of the four-page package you just showed them. Your conversation with them from that moment on needs to revolve around what is called an “involvement close”. Basically, an involvement close is the process of speaking to the propsect like they have already signed on to make a purchase. “Which items ARE you going to display on your home page?”, “ARE you going to have a separate page just for watches?” “How did you want to make changes to the content on the weekly specials page?”. All these questions can not be answered by a yes or no, but rather involve the customer in making decisions as if they’ve already purchased your product. Don’t Sell Websites-Sell What Websites Do! Effective sales people don’t usually talk about the features of whatever they are selling without talking about how those features benefit the buyer. It can be the best looking, most stylish widget on the planet, but if it doesn’t save the owner time or money or somehow make their life better, then they simply won’t buy it. The same is true of your web and print designs. How can they benefit the business owner? How can a small mom and pop jewelry store benefit from being on the World Wide Web? All their customers are local and have been for the twenty plus years that they’ve been in business, and they’ve done just fine without any fancy shmanci websites or brochures. Why should they start now? If you don’t have the answers for those questions when they get asked, and they will get asked, then you’ll be back at your previous employer’s door asking for your old job back right quick. You can tell yourself that you are a designer or graphic artist and not a trained salesperson, but when you are standing in front of that business owner, they will view you as a salesperson and expect to have their questions answered. So, maybe you develop a “cheat sheet” for each prospect that you will call on that answers those basic questions before you ever walk in their door. A little bit of preparation in this regard can go a long way. If you are going to call on a jewelry store, then take some time and look at a half dozen or so jewelry websites. How are they laid out, what do they feature? Is there a common denominator among all the jewelry websites you looked at, like a “special sales” section on the site that promotes a certain type of jewelry or service like cleaning or repairing? Having done this type of homework before you walk in lets the owner know that you took the time to gain some insight into their market and that instills confidence in the owner that doing business with you is the right choice. Know the reasons why having a website can increase traffic in their store. Maybe adding the website address to their sign outside will allow more people passing by to view their current inventory of watches or gold necklaces. Something one of their customers wouldn’t normally be able to do without physically coming into the store. Explain the trend that many more purchases are made online now as opposed to ten years or even five years ago and that business owners need to have an online presence if they are ever going to take advantage of that trend. What do you imagine went through the mind of that blacksmith hammering out horseshoes for a living, the first time he saw a Model T Ford drive around the corner? I hope he was thinking about learning how to make fenders for those new cars, otherwise the new technology was going to shutter his business. The same holds true today. Business owners need to market themselves differently and you, as the web designer/graphic artist can assist them in doing just that. Fantastic article! Bravo! That has always been my weak-point in selling a website to a company when I don’t know anybody inside of the company that has seen my work or worked with me in the past. I think every freelancer will read this article and say…wow, that really did help. If anything it will build confidence when walking into a place to try to get their website to build, redesign, or just do a little cleaning-up! I’d like to see an article about “How to ask new clients to take over their website when they already have somebody ‘in-house’ that does it”. And what I mean by that is that we have all run into that business that we loved, logged onto their website and was like..oh boy, they need some help here. Then we have to try to ask them if we can help without offending the person that designed it. Great article. I’m a freelancer who has literally just started out on my own today. This is good advice, with even better timing! sweet article–very simple, yet a clear reminder of what’s important to get those sales done, the part we apparently all like the least. Really good article – thank you. Interesting that you use a jewelery store analogy. I needed a new watch battery and stopped in a local shop. Starting talking to the owner while I was waiting. Took one look at their biz cards and was mortified – both the design and quality of the print!! As I had just come from the printers, dropping off a job, print quality came up – I started gently sharing some knowledge and the owner was all ears. Here was a golden opportunity to at least leave one of my biz cards. Being that I am not into “hard-sell” and did not go in there to pimp my wears so to speak – I left without so much as leaving a card. Really need to be more mindful of those situations! Beyond those moments are the ever so painful networking events – which I forced myself to go to one at 7:00 am this morning *sigh* There was free food, a guest speaker and I hid in the back – but I did manage to chat with a few people AND did give out a card. Hey for me that’s progress! Amazin article! So much insightful ideas that I’m excited. The best post that I read this month. My weak point, no news, is the sale. And I’m working in this now and this post help me a lot in the process. Talking about comfort zone. I’m suffering for stayed there to much time. Now I’m running like a crazy persecuted by snippers to compensate. I too am horrible at sales, horrible! Once I have a client in the door, I am calm, relaxed, can walk them through a design consultation and generally upsell whatever they are doing. It is just that initial contact that kills me. Here is where our crappy economy comes in. There are many confident people out there who are willing to do marketing for a chance at commission or even a nominal fee. I am a web developer and consultant, its a bit harder to sell something that you can’t really show to your customers when it comes about code or algorithms to make a business more productive. Would you have any suggestions as in how would a sales sheet for someone like me look like? I love the ideas here and I will definitely try them out but the issue I always have is putting a price to my work. Like how much would a 5 page site be? Or how many hours are involved for this said 5pg website and if the client pushes the time it takes with millions of changes when do you start charging supplement hours and for that matter how much do you charge on an hourly rate!? are you a who** to charge on an hourly rate basis? I like the part that says to sell what websites can do… not what they are…. Thanks for sharing, from my experience, always have your business card with you. When you meet new people tell them what you do, lately I have been getting business as a result of word-of-mouth, and its FREE. The first question usually is how much, our industry is so price driven. Good luck to all the freelancers out there. your site is well and nice. a nice read. I find existing contacts the best way of getting work through the door. ‘Cold calls’ can be great if you get someone who’s looking for a site but generally these are harder to come by. I needed this article as usual. Thank you for writing it. Very Nice read !! a truly informative article after a very long time. BIG THANK YOU. I hope Noupe will come out of 25 best of.. type articles, that are flooding, pretty soon. Nice & easy to understand Article. One of the few articles I really read from start to finish. Really its no rocket science, but all businesses including freelance grow slow. :) so Be patient and good luck everyone. Excellent article and not only good for the freelancer who is embarking on a new path. As someone who has been out on their own for 7 years – some things in this article made me rethink my approach to generating business. i thought freelancing is like.. a temporary thing.. it seems you and your 7 years as a freelancer are shuting me up.. im giving my hopes up now.. thanks to you too! I would like thank you very rather a lot for posting and sharing this nice article. It’s so interesting. I wish to know some other details about this site. So please give me this information quickly. Really interesting article. There need to be more articles like this for new freelancers. The challenge of finding new clients is such a difficult task. There must a starting point for freelancers. It’s nice to know everyone feels the same anxiety to the challenge. With more and more people finding themselves out of work, a growing number of people are turning to mini-job sites such as JobbedOut.com to earn some extra money by offering to do small jobs. The reason is simple: there is no listing fee, no minimum payment limit and payments can be withdrawn immediately upon successful delivery of the work. Many of these websites also have a rating system so that you can purchase a service from a seller with confidence. A nice read. Really like the way you mention the facts. 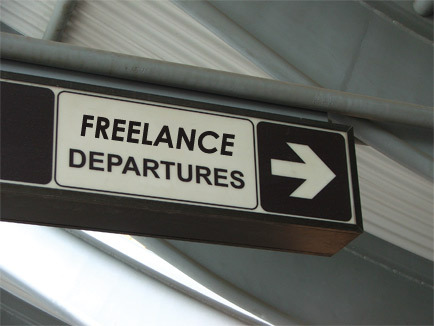 Starting with freelancing while having job also can be a big decision. one needs a full proof plan to get succeed with freelancing. Im a freelancer after a 2 year full time job.. im heading some of that problems and having some difficulty to organize myself in money issues but everything is going really well.. nice article thanks! I hate to be cynical, but I just can’t help feeling hopless about this whole situation the industry is in at the moment. I really enjoyed studying your blog. It by no means happens earlier than, I’ve carried out studying it becuse of all the superior information on yout article very interesting. Bookmarked already. I realize that is off matter but I wanna share this peice of information with all people I can; do not think in psychics! I comprehend it appears crazy but my coronary heart was broken today as one attempted to carry again memories of a misplaced adore one. He was so convincing it’s disgusting! They are scammers! In any case stellar site, but more articles satisfy!